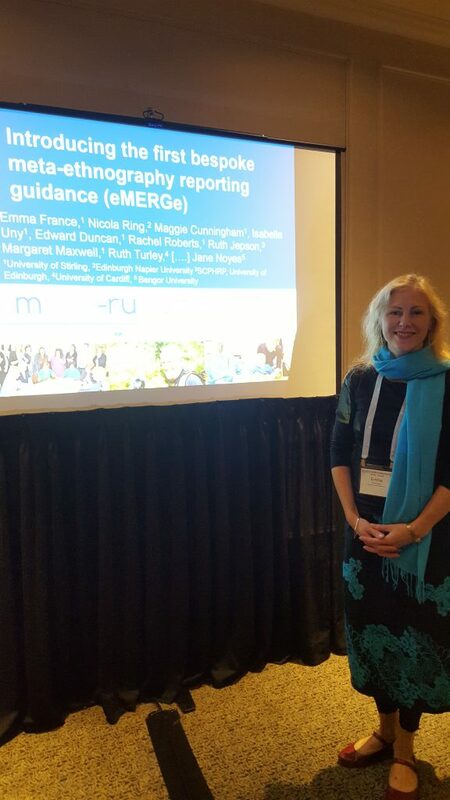 The eMERGe reporting guidance was presented by Dr Emma France at the International Institute of Qualitative Methodology’s 24th Qualitative Health Research Conference in Halifax, Nova Scotia, Canada on Monday 29th October 2018. Emma gave her talk to an engaged and enthusiastic audience of international researchers including postgraduate students and more established academics. The growing interest in the value of qualitative evidence synthesis, including meta-ethnography, for informing health and social care policies and service design was reflected across a number of conference presentations including an inspiring keynote speech by Professor Amanda (Mandy) Kenny of Latrobe University in Victoria, Australia. Publication of the eMERGe meta-ethnography reporting guidance simultaneously across five journals is imminent. Emma France presenting eMERGe in Halifax.